NEW BRITAIN - On the football field, Jacob Dolegala doesn’t like to get too high or too low. After all, it’s the quarterback’s job to remain as even keeled as possible, unfazed by tough situations or big moments. But as Central Connecticut State’s senior signal caller jogged off the practice field, he couldn’t help but admit he was excited for the season opener at Ball State. “I just cannot wait to get on the field and show everybody what I got,” Dolegala said. He had good reason to be. It’s been nine months - 285 days to be exact - since the quarterback played a meaningful snap. Four days before the program’s biggest game, Dolegala’s junior season came to an abrupt end. He was suspended for CCSU’s first ever FCS playoff game for a violation of team rules, leaving backup Tanner Kingsley, who had thrown all of 13 passes, to get the start. The Blue Devils lost to New Hampshire 14-0 in part due to a lack of offense. Dolegala certainly brings plenty of experience to the position. He’s started 22 games over the past two seasons and became the program’s all-time leader in passing yards with 5,908 to go along with 32 touchdowns and 23 interceptions. Last season, Dolegala completed 52.9 percent of his passes for 1,953 yards, with 13 touchdowns and seven interceptions. He also ran for 212 yards and four touchdowns on 52 carries. 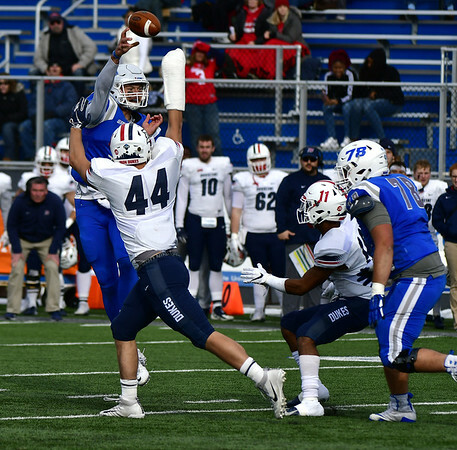 Along the way, the Blues Devils responded to a 0-3 start by winning eight straight and capturing their first Northeast Conference title since 2010 with the quarterback’s play in 2017 and his ability to avoid turnovers a key reason why. Of course, there have been some things Dolegala has worked on throughout the offseason to get prepared for his final year of collegiate football. The quarterback has put on more weight, adding more muscle to the 6-foot-6, 235-pound frame he had last year. But for all the physical work Dolegala has put in this offseason, it’s been his growth mentally and his ability to see different things he might have missed a year or two ago that has continued to impress Rossomando. Having that veteran presence should be helpful tonight against Ball State. Dolegala, as well as most of the team, has already faced a Division I FBS opponent, having played Syracuse at the Carrier Dome last season. But Dolegala likes where the team is at heading into the matchup. And of course, the quarterback is relishing the opportunity to get back out on the field and play a game. It also doesn’t hurt it’s a step up in competition. Dolegala stood on the field quiet for a moment, but soon jogged off the field. He had a game to prepare for that was nine months in the making. Posted in New Britain Herald, CCSU on Wednesday, 29 August 2018 21:15. Updated: Thursday, 30 August 2018 15:45.